I appreciate author Henderson’s serious intentions, which are announced not only by his work’s sheer bulk but by its wide scope and ambitious perspective. 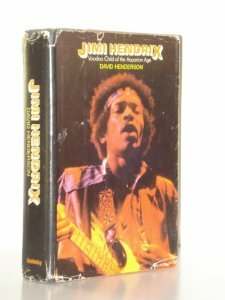 I did, moreover, learn from and enjoy enough of this biography to suggest that Hendrix’s more ardent fans might want to take a look. For a variety of reasons, though, that’s about as positive as I can be. The incompetence suggested by such lapses certainly doesn’t help Henderson to achieve credibility. But what most makes one question the book is his penchant for embellishing facts and inventing quotes in order to turn his research into a smooth narrative. Sure, this approach has been used successfully by other authors, but few have taken it to Henderson’s lengths. In one typical scene, he purports to give us a word-for-word account of what two women said while alone together in a ladies’ room; even if one of them was concealing a tape recorder, that wouldn’t explain such other ostensible reportage as the section where the author supposedly presents the detailed thoughts of a dying, unconscious Hendrix.